Additional spatial dimensions may seem like a wild and crazy idea at first, but there are powerful reasons to believe that there really are extra dimensions of space. One reason resides in string theory, in which it is postulated that the particles are not themselves fundamental but are oscillation modes of a fundamental string. 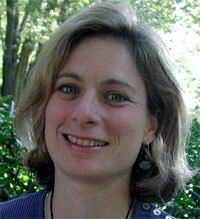 LISA RANDALL is a professor of physics at Harvard University, where she also earned her PhD (1987). She was a President's Fellow at the University of California at Berkeley, a postdoctoral fellow at Lawrence Berkeley Laboratory, and a junior fellow at Harvard before joining the MIT faculty in 1991. Between 1998 and 2000, she had a joint appointment at Princeton and MIT as a full professor, and she moved to Harvard as a full professor in 2001. Her research in theoretical high energy physics is primarily related to exploring the physics underlying the standard model of particle physics. This has involved studies of supersymmetry and, most recently, extra dimensions of space. LISA RANDALL: Particle physics has contributed to our understanding of many phenomena, ranging from the inner workings of the proton to the evolution of the observed universe. Nonetheless, fundamental questions remain unresolved, motivating speculations beyond what is already known. These mysteries include the perplexing masses of elementary particles; the nature of the dark matter and dark energy that constitute the bulk of the universe; and what predictions string theory, the best candidate for a theory incorporating both quantum mechanics and general relativity, makes about our observed world. Such questions (along with basic curiosity) have prompted my excursions into theories that might underlie currently established knowledge. Some of my most recent work has been on the physics of extra dimensions of space and has proved rewarding beyond expectation. Particle physics addresses questions about the forces we understand—the electromagnetic force, the weak forces associated with nuclear decay, and the strong force that binds quarks together into protons and neutrons—but we still have to understand how gravity fits into the picture. String theory is the leading contender, but we don't yet know how string theory reproduces all the particles and physical laws we actually see. How do we go from this pristine, beautiful theory existing in ten dimensions to the world surrounding us, which has only four—three spatial dimensions plus time? What has become of string theory's superfluous particles and dimensions? Sometimes a fruitful approach to the big, seemingly intractable problems is to ask questions whose possible answers will be subject to experimental test. These questions generally address physical laws and processes we've already seen. Any new insights will almost certainly have implications for even more fundamental questions. For example, we still don't know what gives rise to the masses of the fundamental particles—the quarks, leptons (the electron, for example), and electroweak gauge bosons—or why these masses are so much less than the mass associated with quantum gravity. The discrepancy is not small: The two mass scales are separated by sixteen orders of magnitude! Only theories that explain this huge ratio are likely candidates for theories underlying the standard model. We don't yet know what that theory is, but much of current particle physics research, including that involving extra dimensions of space, attempts to discover it. Such speculations will soon be explored at the Large Hadron Collider in Geneva, which will operate at the TeV energies relevant to particle physics. The results of experiments to be performed there should select among the various proposals for the underlying physical description in concrete and immediate ways. If the underlying theory turns out to be either supersymmetry or one of the extra dimension theories I will go on to describe, it will have deep and lasting implications for our conception of the universe. Right now, I'm investigating the physics of the TeV scale. Particle physicists measure energy in units of electron volts. TeV means a trillion electron volts. This is a very high energy and challenges the limits of current technology, but it is low from the perspective of quantum gravity, whose consequences are likely to show up only at energies sixteen orders of magnitude higher. This energy scale is interesting because we know that the as-yet-undiscovered part of the theory associated with giving elementary particles their masses should be found there. However, like many theories, supersymmetry looks fine in the abstract but leaves many questions unresolved when you get down to the concrete details of how it connects to the world we actually see. At some energy, supersymmetry must break down, because we haven't yet seen any "superpartners." This means that the two particle partners—for example, the electron and the selectron—cannot have exactly the same mass; if they did, we would see both. The unseen partner must have a bigger mass if it has so far eluded detection. We want to know how this could happen in a way consistent with all known properties of elementary particles. The problem for most theories incorporating supersymmetry-breaking is that all sorts of other interactions and decays are predicted which experiment has already ruled out. The most obvious candidates for breaking supersymmetry permit the various kinds of quarks to mix together, and particles would have a poorly defined identity. The absence of this mixing and the retention of the various quark identities is a stringent constraint on the content of the physical theory associated with supersymmetry-breaking, and is one important reason that people were not completely satisfied with supersymmetry as an explanation of the TeV scale. To find a consistent theory of supersymmetry requires introducing physics that gives masses to the supersymmetric partners of all the particles we know to exist, without introducing interactions we don't want. So it's reasonable to look around for other theories that might explain why particle masses are associated with the TeV energy scale and not one that is sixteen orders of magnitude higher. There was a lot of excitement when it was first suggested that extra dimensions provide alternative ways to address the origin of the TeV energy scale. Additional spatial dimensions may seem like a wild and crazy idea at first, but there are powerful reasons to believe that there really are extra dimensions of space. One reason resides in string theory, in which it is postulated that the particles are not themselves fundamental but are oscillation modes of a fundamental string. The consistent incorporation of quantum gravity is the major victory of string theory. But string theory also requires nine spatial dimensions, which, in our observable universe, is obviously six too many. The question of what happened to the six unseen dimensions is an important issue in string theory. But if you're coming at it from the point of view of the relatively low-energy questions, you can also ask whether extra dimensions could have interesting implications in our observable particle physics or in the particle physics that should be observable in the near future. Can extra dimensions help answer some of the unsolved problems of three-dimensional particle physics? People entertained the idea of extra dimensions before string theory came along, although such speculations were soon forgotten or ignored. It's natural to ask what would happen if there were different dimensions of space; after all, the fact that we see only three spatial dimensions doesn't necessarily mean that only three exist, and Einstein's general relativity doesn't treat a three-dimensional universe preferentially. There could be many unseen ingredients to the universe. However, it was first believed that if additional dimensions existed they would have to be very small in order to have escaped our notice. The standard supposition in string theory was that the extra dimensions were curled up into incredibly tiny scales—10 33 centimeters, the so-called Planck length and the scale associated with quantum effects becoming relevant. In that sense, this scale is the obvious candidate: If there are extra dimensions, which are obviously important to gravitational structure, they'd be characterized by this particular distance scale. But if so, there would be very few implications for our world. Such dimensions would have no impact whatsoever on anything we see or experience. From an experimental point of view, though, you can ask whether extra dimensions really must be this ridiculously small. How large could they be and still have escaped our notice? Without any new assumptions, it turns out that extra dimensions could be about seventeen orders of magnitude larger than 10-33 cm. To understand this limit requires more fully understanding the implications of extra dimensions for particle physics. If there are extra dimensions, the messengers that potentially herald their existence are particles known as Kaluza-Klein modes. These KK particles have the same charges as the particles we know, but they have momentum in the extra dimensions. They would thus appear to us as heavy particles with a characteristic mass spectrum determined by the extra dimensions' size and shape. Each particle we know of would have these KK partners, and we would expect to find them if the extra dimensions were large. The fact that we have not yet seen KK particles in the energy regimes we have explored experimentally puts a bound on the extra dimensions' size. As I mentioned, the TeV energy scale of 10-16 cm has been explored experimentally. Since we haven't yet seen KK modes and 10-16 cm would yield KK particles of about a TeV in mass, that means all sizes up to 10-16 are permissible for the possible extra dimensions. That's significantly larger than 10 33 cm, but it's still too small to be significant. This is how things stood in the world of extra dimensions until very recently. It was thought that extra dimensions might be present but that they would be extremely small. But our expectations changed dramatically after 1995, when Joe Polchinski, of the University of California at Santa Barbara, and other theorists recognized the importance of additional objects in string theory called branes. Branes are essentially membranes—lower-dimensional objects in a higher-dimensional space. (To picture this, think of a shower curtain, virtually a two-dimensional object in a three-dimensional space.) Branes are special, particularly in the context of string theory, because there's a natural mechanism to confine particles to the brane; thus not everything need travel in the extra dimensions even if those dimensions exist. Particles confined to the brane would have momentum and motion only along the brane, like water spots on the surface of your shower curtain. Branes allow for an entirely new set of possibilities in the physics of extra dimensions, because particles confined to the brane would look more or less as they would in a three-plus-one-dimension world; they never venture beyond it. Protons, electrons, quarks, all sorts of fundamental particles could be stuck on the brane. In that case, you may wonder why we should care about extra dimensions at all, since despite their existence the particles that make up our world do not traverse them. However, although all known standard-model particles stick to the brane, this is not true of gravity. The mechanisms for confining particles and forces mediated by the photon or electrogauge proton to the brane do not apply to gravity. Gravity, according to the theory of general relativity, must necessarily exist in the full geometry of space. Furthermore, a consistent gravitational theory requires that thegraviton, the particle that mediates gravity, has to couple to any source of energy, whether that source is confined to the brane or not. Therefore, the graviton would also have to be out there in the region encompassing the full geometry of higher dimensions—a region known as the bulk—because there might be sources of energy there. Finally, there is a string-theory explanation of why the graviton is not stuck to any brane: The graviton is associated with the closed string, and only open strings can be anchored to a brane. A scenario in which particles are confined to a brane and only gravity is sensitive to the additional dimensions permits extra dimensions that are considerably larger than previously thought. The reason is that gravity is not nearly as well tested as other forces, and if it is only gravity that experiences extra dimensions, the constraints are much more permissive. We haven't studied gravity as well as we've studied most other particles, because it's an extremely weak force and therefore more difficult to precisely test. Physicists have showed that even dimensions almost as big as a millimeter would be permitted, if it were only gravity out in the higher-dimensional bulk. This size is huge compared with the scales we've been talking about. It is a macroscopic, visible size! But because photons (which we see with) are stuck to the brane, too, the dimensions would not be visible to us, at least in the conventional ways. Once branes are included in the picture, you can start talking about crazily large extra dimensions. If the extra dimensions are very large, that might explain why gravity is so weak. (Gravity might not seem weak to you, but it's the entire earth that's pulling you down; the result of coupling an individual graviton to an individual particle is quite small. From the point of view of particle physics, which looks at the interactions of individual particles, gravity is an extremely weak force.) This weakness of gravity is a reformulation of the so-called hierarchy problem—that is, why the huge Planck mass suppressing gravitational interactions is sixteen orders of magnitude bigger than the mass associated with particles we see. But if gravity is spread out over large extra dimensions, its force would indeed be diluted. The gravitational field would spread out in the extra dimensions and consequently be very weak on the brane—an idea recently proposed by theorists Nima Arkani Hamed, Savas Dimopoulos, and Gia Dvali. The problem with this scenario is the difficulty of explaining why the dimensions should be so large. The problem of the large ratio of masses is transmuted into the problem of the large size of curled-up dimensions. Raman Sundrum, currently at Johns Hopkins University, and I recognized that a more natural explanation for the weakness of gravity could be the direct result of the gravitational attraction associated with the brane itself. In addition to trapping particles, branes carry energy. We showed that from the perspective of general relativity this means that the brane curves the space around it, changing gravity in its vicinity. When the energy in space is correlated with the energy on the brane so that a large flat three-dimensional brane sits in the higher-dimensional space, the graviton (the particle communicating the gravitational force) is highly attracted to the brane. Rather than spreading uniformly in an extra dimension, gravity stays localized, very close to the brane. In cosmology, for instance. Alan Guth's mechanism whereby exponential expansion smooths out the universe works very well, but another possibility has been suggested: a cyclic universe, Paul Steinhardt's idea, wherein a smaller amount of exponential expansion happens many times. Such a theory prompts you to ask questions. First of all, is it really consistent with what we see? The jury's out on that. Does it really have a new mechanism in it? In some sense, the cyclic idea still uses inflation to smooth out the universe. Sometimes it's almost too easy to come up with theories. What grounds your theories? What ties them down? What restricts you from just doing anything? Is there really a new idea there? Do we really have a new mechanism at work? Does it connect to some other, more fundamental theoretical idea? Does it help make that work? Recently I have been exploring the implications of extra dimensions for cosmology. It seems that inflation with extra dimensions works even better than without! What's so nice about this theory is that one can reliably calculate the effect of the extra dimension; no ad hocassumptions are required. Furthermore, the theory has definite implications for cosmology experiments. All along, I've been emphasizing what we actually see. It's my hope that time and experiments will distinguish among the possibilities.